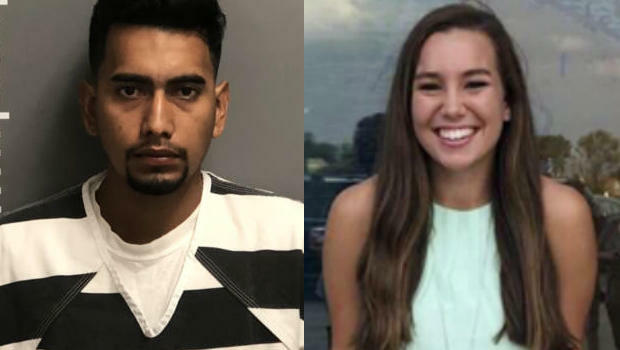 MONTEZUMA, Iowa — The farmhand charged in the abduction and stabbing death of 20-year-old Mollie Tibbetts in Iowa has pleaded not guilty to first-degree murder. Cristhian Bahena Rivera is charged in the killing of Tibbetts, a University of Iowa student who disappeared while out for a run July 18 in Brooklyn, Iowa. Investigators recovered her body a month later in a cornfield. A medical examiner said Tibbetts was stabbed to death. Rivera entered his plea Wednesday at the Poweshiek County Courthouse in Montezuma, Iowa. Rivera, 24, worked at a dairy farm a few miles from where Tibbetts disappeared. He is a Mexican national who has been accused of being in the country illegally. Tibbetts' father, Rob Tibbetts, has urged the public not to bring his daughter's death into the divisive and racially-charged debate over immigration. "The person who is accused of taking Mollie's life is no more a reflection of the Hispanic community as white supremacists are of all white people," he recently wrote in an opinion piece for the Des Moines Register. Rivera waived his right to be tried within 90 days. Trial is set for April 16.